The custom of sending Christmas cards was started in the United Kingdom in 1843. The new Post Office was able to offer a penny stamp because new railways were being built which could carry much more post than the horse and carriage which had previously been used by only a few elite. 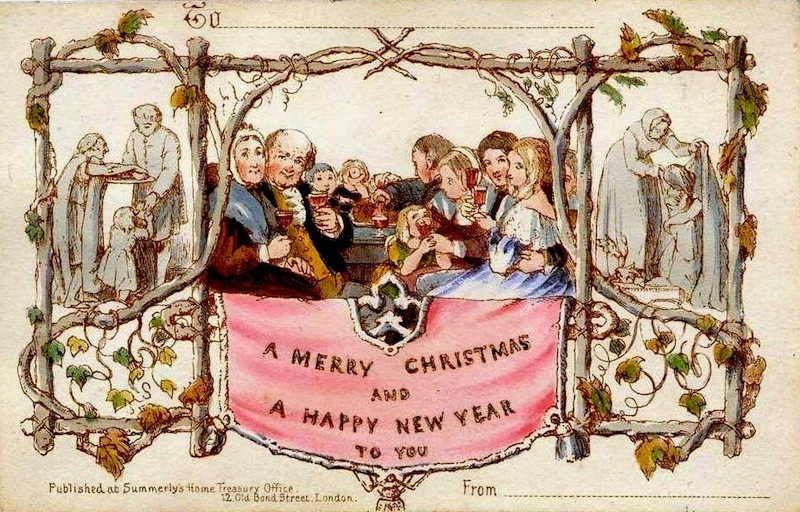 Using the newly created Penny Post, the first commercial Christmas card was designed by London artist John Calcott Horsley. It featured people feeding and clothing the poor on one side with a picture of a Christmas party on the other side. The card read, “Merry Christmas and a Happy New Year to you.” One thousand of these original cards were printed. Christmas Cards appeared in the United States a few years later, but the early US cards were very expensive and most people couldn’t afford them. In 1875, Louis Prang, a German printer who had also worked on early cards in the UK, started mass producing cards in the US so more people could afford to buy them. With this, their popularity grew. The now widely recognized brand Hallmark Cards was established in 1915 by John C. Hall and two of his brothers to market their self-produced Christmas cards. In 1917, the Halls “invented” modern wrapping paper when they ran out of traditional colored tissue paper and improvised by selling fancy decorated French envelope linings. You've made a great decision! Send us a message and we'll be in touch.